If you know someone, perhaps a friend or loved one, who has been arrested and taken into custody in the City of Burbank, CA., you’ve probably got a lot of questions. Times like this can be stressful, and you should know that we’re here to help. Our company has years of experience in the bail industry and is dedicated to helping our clients quickly and discreetly. If you’d like to speak with us regarding Burbank Bail Bonds, call and speak directly with a local, licensed, professional bail bondsman any time of day or night at 818-425-3325 or 855-414-BAIL (2245). Those who are arrested by the Burbank police are taken to the Burbank City Police Station Jail to undergo booking and processing. This is the procedure in which an inmate’s fingerprints are recorded, photographs are taken and a national background check is conducted. Once complete, bail will be set and it will be possible to secure their release on bond. 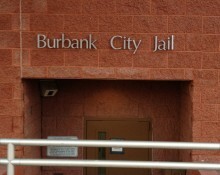 Despite the size of the city, the Burbank Jail is rather small. It’s capable of holding a maximum of 75 inmates at any one time, and only on a temporary basis as they await their arraignment in court. If the jail becomes overcrowded, inmates will likely be transferred to one of the downtown jails. Men are usually transferred to Twin Towers and women are taken to the Lynwood Jail. When the transfer occurs, the inmates will have to go through another processing procedure at the larger, much busier jail; often resulting in an additional 24 hours in custody. If the bail bond process is begun quickly enough, though, the inmate can be bailed out directly from the Burbank jail and avoid the additional time in custody. Inmates can be visited at the Burbank Jail 7 days a week from 2 p.m. to 3:30 p.m.
All visitations are limited to 15 minutes, and will require a valid form of ID if you wish to visit an inmate. A bail bond isn’t the only option for release from jail, however it’s usually the cheapest and the easiest. When you call us, you get the benefit of our years of experience in the bail industry. We can quickly navigate the jail system, locate your friend or loved one, verify their eligibility for bail and get the bail bond application process started very quickly. As a matter of fact, you can get the entire process completed from start to finish without even leaving the comfort of your own home; we can easily get you the relevant bail bond application forms via fax or email. Do you want to get the bail bond application process started right away? If so, please feel free to call us locally at 818-900-2245 or toll-free, at 855-414-BAIL (2245). A Burbank bail bondsman is available 24/7 x 365 days a year to take your call.